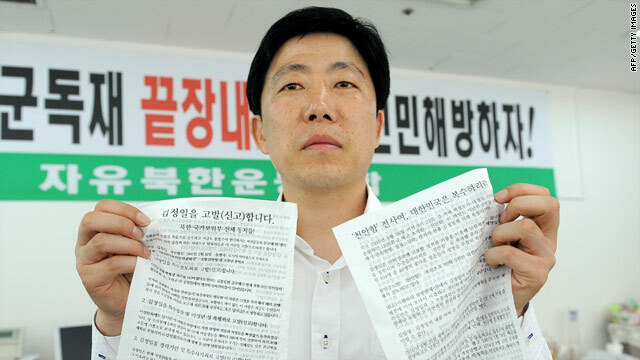 Park Sang Hak, an activist and former defector from North Korea, shows anti-Pyongyang leaflets as he prepares propaganda in Seoul. Seoul, South Korea (CNN) -- Park Sang Hak and his family jammed 150,000 sheets of paper, dollar bills, DVDs and tiny AM/FM radios inside bags attached to giant inflatable helium balloons. They launched them into the sky where they floated 200 km (124 miles) across the border to North Korea. The message: Kim Jong Il is lying to you. Renewed worldwide pressure on Pyongyang has given urgency to North Korean defectors living in Seoul who hope to reach North Koreans. The balloons are the weapons in breaking Kim Jong Il's spell, say the Fighters for Free North Korea. The group, made up primarily of North Korean defectors, says if North Korea can't get any messages from the outside world, then outside world must deliver those messages in. How? The giant helium balloons carrying the garbage bags of propaganda, which can fly 200 kilometers over the border, straight into the heart of Pyongyang. It's the heart of Kim Jong Il's regime that these defectors hope to strike, by destroying the illusion it has built for its citizens. "My brothers are still living there," said Kwon Young-Hee, who defected to Korea a decade ago. "I will be happy if they can come after reading these messages. North Koreans know nothing about Kim Jong Il except for his power as general and chief of the country. We want them to know the truth." In North Korea, all public discourse, from media to education, is controlled by the military regime. A little radio, says North Korean defector Park Sang-hak, is a big weapon. "I'm sending this off with the hope of reaching my people, who I left behind," said Park, as he watched the balloons lift into the sky heading northward. "If they get these, I hope they will be able to reflect on the true meaning of freedom. The two Koreas halted decades of propaganda warfare under a 2004 reconciliation deal. But ties have soured in the wake of the sinking of the South Korean warship, the Cheonan, last March. It's reinvigorated the propaganda war among North Korean defectors in the south. Kim Seong-Min runs Free North Korea Radio, broadcasting from the third floor of a small office building in the outskirts of Seoul. He may be in South Korea, but the audience, he hopes, is North Korea's citizens, listening from illegal radios. Kim, who fled North Korea a decade ago, says the Cheonan warship sinking should show the international community that negotiations with Pyongyang will never work, and it must try to reach the North Koreans directly. It worked for me, said Kim, who recalls how he heard a story on an illegal radio in North Korea. "Listening to the stories, I thought maybe this is propaganda from the south," he said. The important part, he said, is that he began to question the unquestionable military regime. Just the question led to him fleeing the North. "I want to see it for myself," he said, referring to the free world. While the propaganda war is heating up, people in Seoul say the prospect of an actual war feels remote. South Koreans, long used to the heated battle and rhetoric between the nations, are going about their normal lives. "I don't think war will take place," said Park Kyung-hee, as she shopped with her son in a busy market in downtown Seoul. "Although the Cheonan incident is serious, the country will be safe because we have strong ties with our allies. The north would never invade us." American Mischa Moreau, who has lived in Seoul for three years, said she doesn't feel any sense of danger. "It does not feel like war. The feeling I get from the Korean people here, it's very easygoing and they go on with their life and I do too. It's very comforting."